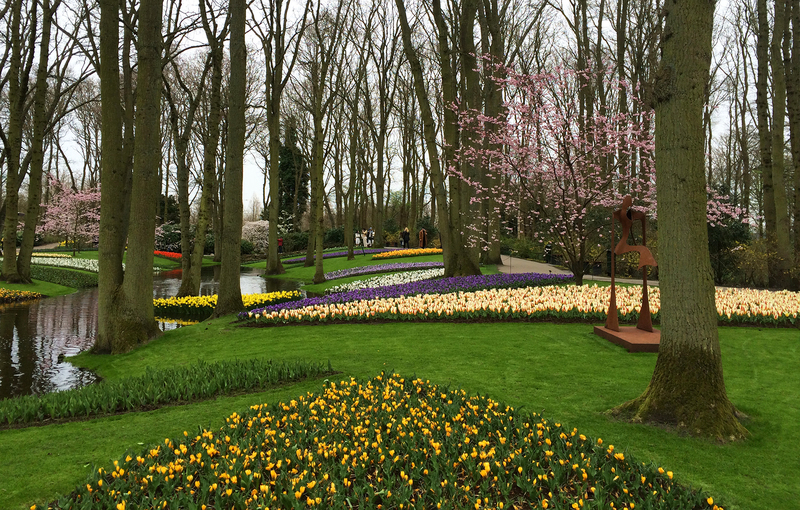 If you’re visiting the Netherlands during springtime, one thing that should be on the top of your list is Keukenhof. What is Keukenhof you ask? For 8 weeks every year (roughly from the end of March through mid-May) this 79-acre park comes to life with a colorful display of more than 7 million bulbs, including 800 varieties of the region’s iconic tulip. Known as the “Garden of Europe” and arguably one of the most impressive flower displays in the world, it was originally established in 1949 as a flower show for growers and exporters and now in its 67th year attract nearly 1 million visitors annually. Keukenhof is truly a celebration of the country’s rich heritage, which dates back to the “tulipmania” of the Dutch Golden Age and has led the Netherlands to become the producer of 70% of the world’s commercial flower output today. Talk about some serious flower power. Keukenhof is located about 12 miles south of Schiphol Airport in the small town of Lisse and is easily accessible via public transportation. From Amsterdam’s Centraal Station, take the 15 minute train ride to the airport where you’ll pick up the Keukenhof Express bus #858 outside of Schiphol Plaza (in the same area where other buses and taxis depart – if you can’t find it, don’t hesitate to ask, people are usually more than happy to point you in the right direction). After a 30 minute bus ride, you’ll be dropped off right at the front entrance of the park. You can also reach Keukenhof from other nearby cities including Haarlem and Leiden. Combo tickets that cover public transportation and entrance to the park are available on Keukenhof’s website and will help save you a few euros. There’s also ample parking if you have your own car and prefer to drive to Keukenhof. Keukenhof reminded me of an enchanted fairytale land that you would expect to find somewhere far, far away, with meticulously manicured lawns and flower beds representing every color of the spectrum. I was impressed to learn about the detailed planning and planting process that goes into making sure there will be flowers to see throughout the 8 week period, whether you go the first week or the last (AND the park is redesigned every year!). As we made our way through the different sections of the park, we were lured by the end of the crocuses, daffodils and hyacinths galore, plus many early tulip, all with little placards noting the name of each flower variety. Take a break and visit one of Keukenhof’s indoor pavilions, which host a variety of different flower shows and demonstrations. My favorite was the central Willem-Alexander pavilion with rows of tulips in more colors, shapes and varieties than you ever thought existed. You’ll also find food carts throughout the park selling Dutch specialties – do NOT pass up the stroopwafels near the windmill, which are made before your eyes and served warm and gooey – as well as several cafeterias for a sit-down meal. Other highlights include a playground, maze and petting zoo area for kids, thematic gardens, gift shops and more. 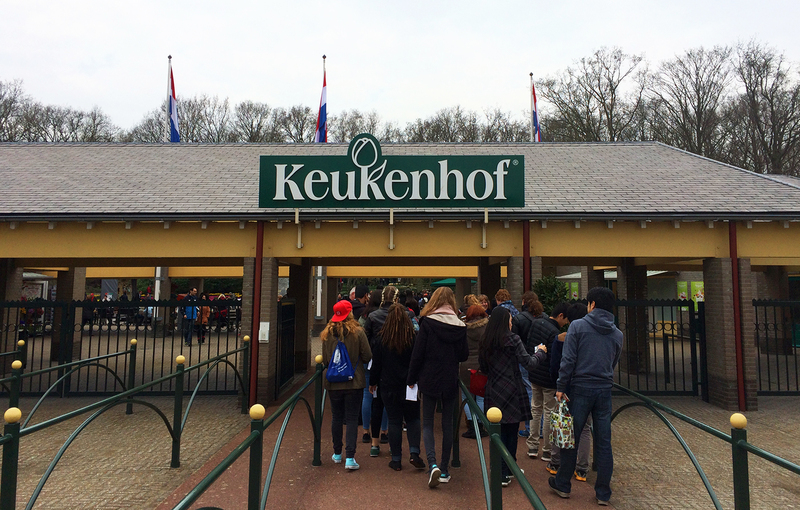 You can easily spend half a day at Keukenhof (we were there for about 4 hours). The park is ever-changing and gorgeous to say the least, and definitely a unique, once-in-a-lifetime experience. Below is a gallery of just a few of my many photos. First and foremost, it’s not an exact science as to when the flowers will be in bloom. As you would expect, this is highly dependent on whether the region is experiencing an early or late spring, so go with an open mind to appreciate Mother Nature at work. 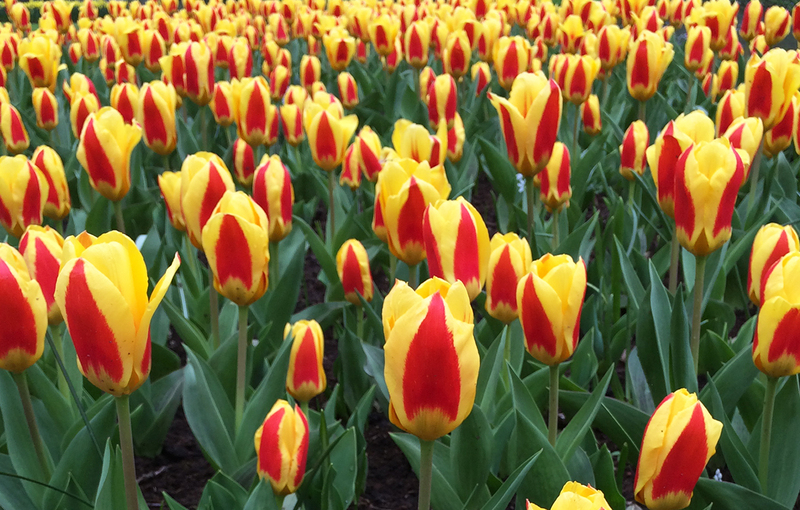 I also found it helpful to sign up for the Tulips in Holland newsletter, which sends out weekly updates on the status of the flowers in the region. You can also look back at past years’ reports to get a sense of when the flowers may be in bloom. 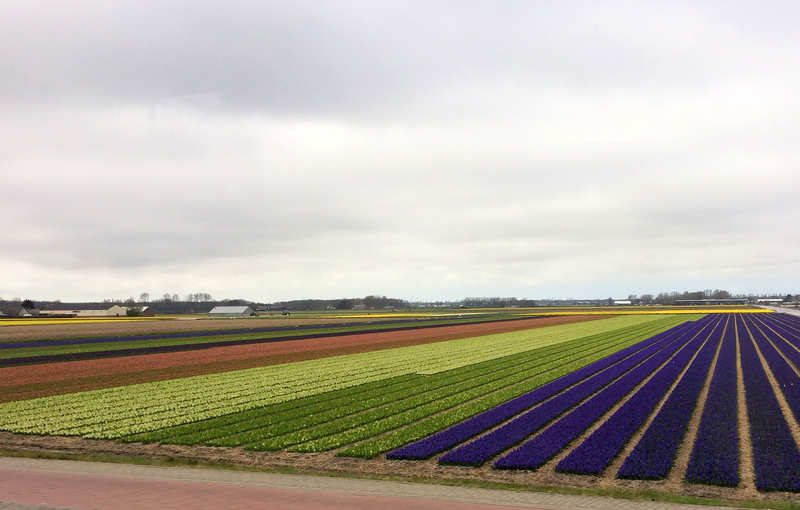 Keukenhof is located in the heart of the Bollenstreek (“bulb region”), so after visiting the park consider renting a bike from Rent-A-Bike Van Dam (look for the kiosk located in the parking lot) to explore the rainbow-stripped fields. 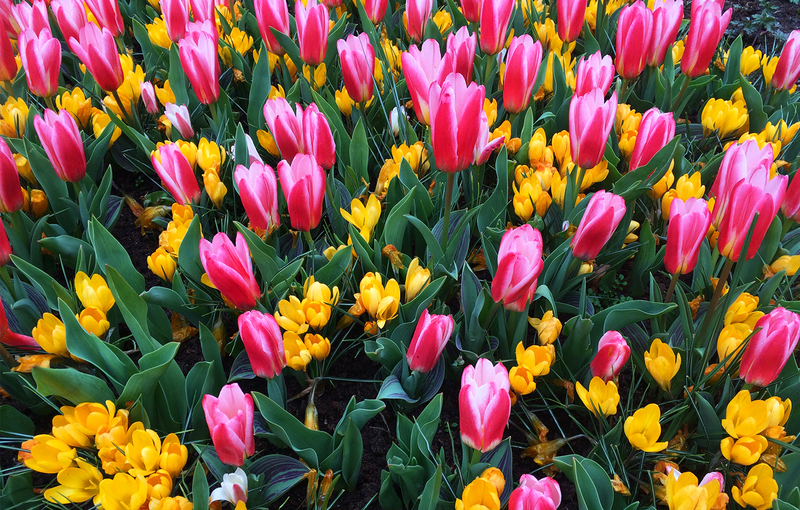 Like something you’d expect to find at a modern art museum, you’ll see a kaleidoscope of colors from yellow daffodils to purple hyacinths and countless shades and varieties of tulips lined up side-by-side. 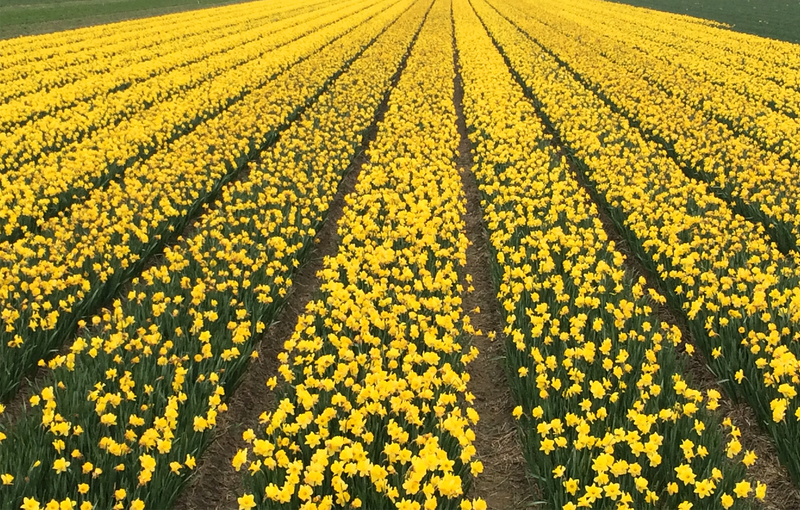 When I visited in early April, we were treated to countless fields of sunny daffodils and were delighted to discover some early tulips in bloom. 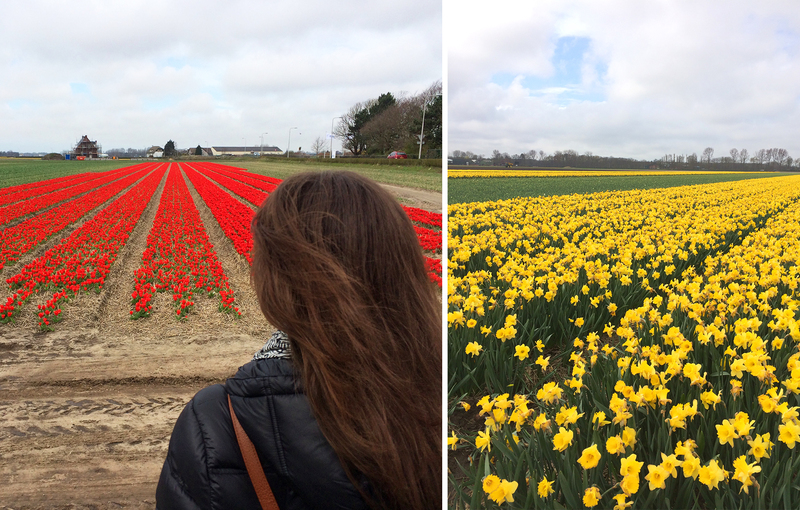 Even though our trip was a little early in the season, the flowers we saw did not disappoint and left me imagining just how spectacular the flowers at both Keukenhof and the surrounding area will soon look at their peak. Finally, since you’ll spend the majority of the day outdoors, definitely check the weather in advance and be prepared for different conditions ranging from rain (umbrellas and good shoes) to sun (hats and sunglasses). Wow thanks for that tip! 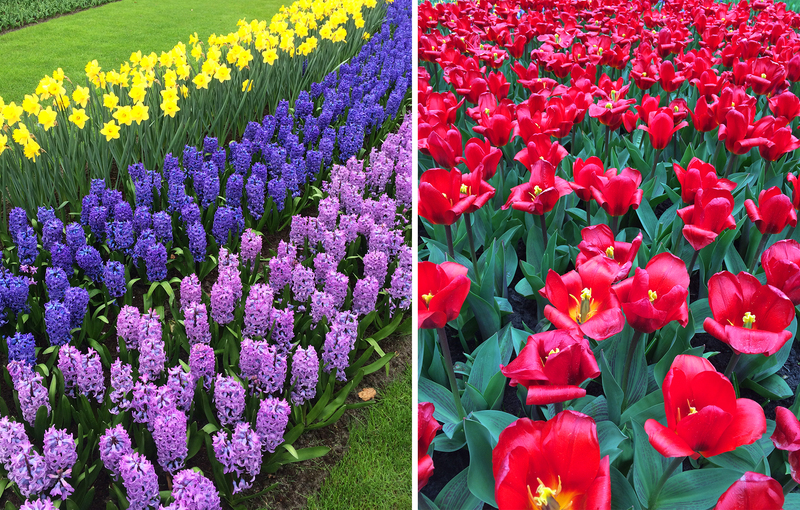 I never heard about Keukenhof before, but it looks amazing – flower power indeed! It really was! Definitely add it to your future travel list, especially if you can time it to when the flowers are at their peak! Mine too! I especially love how much thought and effort is put into designing the displays each year.